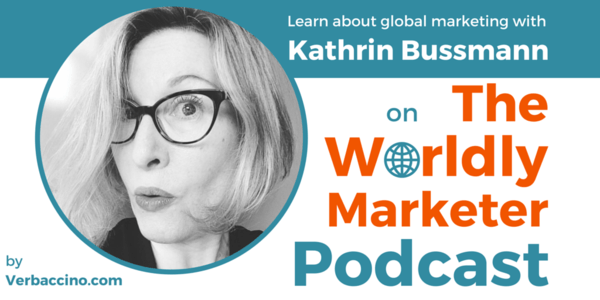 Welcome to the very first episode of The Worldly Marketer Podcast! I’m your host, Kathrin Bussmann. This particular episode is a relatively short one (under 15 minutes). It’s just an opportunity for me to introduce myself, explain why I created this podcast, and talk a bit about what you can look forward to in future episodes. Some background about me: I’m a German-Canadian who was born and raised in the province of Quebec. If you’re not familiar with Quebec, it’s one of the 10 provinces of Canada, and it’s the only province where English is not an official language. That’s because the majority of the population there is French-speaking, so the official language is French. When I was born, my parents had just immigrated from Germany. So I grew up with three languages: German at home, French outside the home – including at school – and English in certain other social circles and through the media. Because I used each language in separate situations and with different sets of people, I learned from a very young age to switch not only between languages, but also between cultures. So I was able to experience first hand the ways in which language and culture are naturally linked, and how they shape people’s perceptions of – and interactions with – the world around them. I guess that’s why I’ve always been fascinated with languages and culture, and the dynamics between them. While pursuing a degree in Communication Studies at the University of Ottawa, I discovered the field of Linguistics, which is the scientific study of human language. I was smitten, and became particularly fascinated with historical linguistics. So I went on to get a B.A., M.A. and, eventually, a Ph.D. in Linguistics from Humboldt University in Berlin. What can I say: I had lots of encouragement, and there are a lot of academics in my family. I guess I always figured I’d pursue an academic career too. By the time I finished my Ph.D., though, I was ready to leave academia and get out into the “real world”. I felt like I wanted to start working on more practical problems and do something that would be truly helpful to people. Around that same time, my daughter came along – and as any parent knows, life doesn’t get much less theoretical than when you become a parent. In fact, raising a child is probably the most hands-on, practical occupation there is, especially when that’s your full-time focus. Fast forward to May 2014. I originally founded Verbaccino as a kind of boutique communication-services agency specializing in creating multilingual content. But what it really turned into for me was a crash course in entrepreneurship and marketing. In fact, I became completely fascinated with marketing in general, and with international marketing in particular. So over the past year or so, I’ve also been busy pivoting my business. I’m now much more focused on marketing strategies for international growth. My new mission is to help North American brands leverage today’s new digital marketplace, which – like it or not – is becoming increasingly global, social and multilingual. Because I’m a recovering academic, the first thing I do when I want to become an expert at something is to throw myself into lots of research. I figure out what the issues are, who the thought leaders are, and I start reading everything I can get my hands on. And because I’m a huge fan of podcasts, I also try to find relevant podcasts that I can learn from. Unfortunately, in the case of international and global marketing, I’ve found the podcast pickings to be rather slim – though I did discover some excellent podcasts dealing with related topics, and I’ve recommended them in a recent blog post. So full disclosure: my reasons for creating The Worldly Marketer Podcast are not entirely altruistic. Really, I’m scratching my own itch. It’s the podcast that I wished already existed, so I’ve decided to go ahead and create it myself. And I hope that it will become a helpful resource for anyone else who wants to learn more about what it takes for brands – even small ones – to “go global” in the Digital Age. Now I’m happy to report that there are a few new podcasts in the works by other people in the global marketing industry, and I’ve already had a chance to talk to some of them in the context of this podcast. It’s very exciting to see these new podcasts coming up because as a consumer of them, I say: the more, the merrier. There’s lots of room for fresh contributions on the topic global marketing, which is a very wide and very complex field. They can include everything from translation and localization issues to international SEO, social media strategies, cross-cultural communication, and the latest insights into particular foreign consumer markets. This podcast is going to be a weekly interview-style show. My goal is to talk to a wide variety of specialists in the field of global marketing, and to learn as much from them as I can. In the process, I hope to create a body of content that will be helpful to other entrepreneurs and marketers who are interested in exploring today’s global possibilities. If you have a particular question that you’d like to ask a global marketing expert, I’d love to hear from you. The best way to contact me is through the Verbaccino website. And while you’re there, please join my mailing list so I can keep you in the loop about future episodes of the podcast.